An evergreen shrub that prefers a moist, well-drained soil. 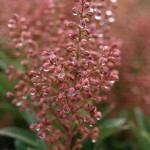 The flower buds resemble pink beads in large clusters, carried above the foliage. 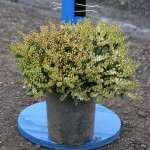 They will open to creamy white flowers in early to mid-spring. It prefers full sun to light shade with summer moisture. Tidy the plant up after the flowers have faded by lightly shearing or snapping off the dead flower heads. 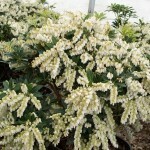 This is a great, small growing shrub, and can be used as an informal hedge, in a border, or even in a container.